The Para Servir Internship 2018 has forever impacted my life. I have made some forever memories with the family we worked with in Guatemala, forever relationships with our foreman, forever friendships with all of the intern girls, and a forever flame that burns in my heart to share the good news of the Gospel and live my life serving the way that Jesus did while He was on planet earth. In Guatemala, or any foreign country, where you go to serve and love on the people there, to be honest, it’s so easy. Yes, there are struggles such as missing home or the simple luxury of being able to throw toilet paper into the toilet, but other than those few things there is so much joy when you wake up in a BEAUTIFUL country and have nothing else to think about but who am I going to serve today and how can I show Lilian and her children God’s love! The main struggle I find in life is following scripture when it says, “But to you who are listening I say: Love your enemies, do good to those who hate you, bless those who curse you, pray for those who mistreat you. If someone slaps you on one cheek, turn to them the other also. If someone takes your coat, do not withhold your shirt from them. Give to everyone who asks you, and if anyone takes what belongs to you, do not demand it back. Do to others as you would have them do to you.” Luke 6:27-31. When I am showered with praise, love, and service from those who you give those things too, it tends to make you want to keep on doing those things. This is where God has to come in and do some serious damage on my pride and self glorification! God reminds me every day that this life is NOT ABOUT ME! Getting back to America and all of a sudden being bombarded by senior year todos, no volcanoes, and needed acts of service, but not getting any reward, I was definitely being tested. Thank God that I had these forever memories and forever friendships with the other interns because in time of weakness and moments where I could throw away all of the wonderful things I learned on the internship, I had community! Girls that would listen and encourage me! 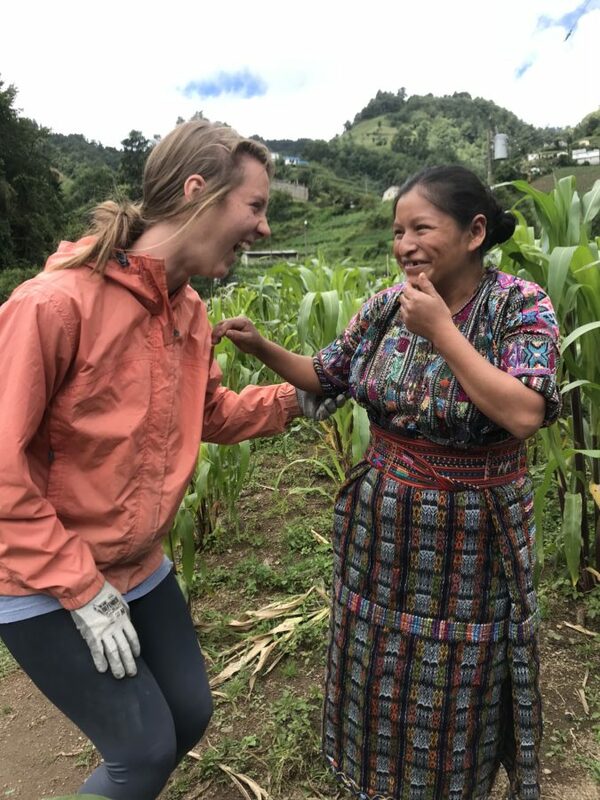 On days when I am being tested, thanks to Para Servir Internship 2018, I have people, books, quotes, devotionals, music, and endless memories that turn me back to God and help me remember that every day we wake up, whether it be in Guatemala or America, we are on a mission. Scripture does not say “go out to a foreign country, on a mission trip, and serve where it is easy.” It says “Go into ALL the world and preach the Gospel to ALL creation,” Mark 16:15! Thank you Dirty Feet Missions for giving myself and other girls the opportunity to serve and love on a day to day basis for 6 weeks. Thank you for giving me tools to be able to continue growing closer to Christ and also growing my passion for Christ. Thank you for all the memories! Thank you Lilian, Hector, Jerson, Kimberly, and Baby Eddie for teaching me how to have pure joy and gratitude! Thank you Carlos and Roberto (our foreman) for really showing me how God can overcome language barriers! Thank you Hilda (our superwoman translator) for showing me how to go above and beyond what is expected without asking for anything in return! Thank you to all of my forever friends for loving me and continuing to brighten up my life after the internship! Thank you to everyone who funded this mission trip! Your money did so much more than send me to Guatemala, it provided a forever home to Lilian and her kids, and it brought God to Guatemala! The impact that this trip had on my life and the lives of others is very hard to put into words, although I just typed a lot of them, but I hope you get a good understanding of how LIFE CHANGING it was! Any time I think back on it I get an overwhelming feeling of joy and love! My prayer is that the feeling never leaves and that God will use me as a vessel to spread that feeling and His word!